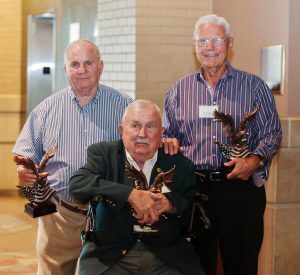 Pictured above are three of the original members of the inaugural class of 1976, Jim Sinadinos, Don Johnson, and Dean Look. Unfortunately Don Johnson passed away not long after this picture was taken. Don was truely one of the true great persons of our community. 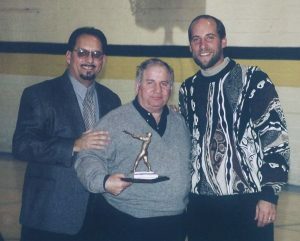 In the picture on the left is Richard Letts recipient Javier Cavazos and Hall of Fame members Jim Sinadinos and John Smoltz. The first induction ceremonies of the Greater Lansing Area Sports Hall of Fame took place in the bicentennial year of 1976. Ten individuals, and three teams were enshrined with the purpose of giving lasting recognition to outstanding individuals, athletic teams, and coaches from the city of Lansing and the surrounding communities. Since then, deserving individuals, and teams have been inducted each July. If you are an individual inductee and would like to update your picture, please contact either Bob Every or Barb DeLeeuw. The photo should be no larger than 8″ x 10″ and may be in either color or black and white.